The Walt Disney World Swan and Dolphin Food & Wine Classic will celebrate its ninth year October 26-28, 2018 with new dishes and themed areas. Culinary offerings during the event will feature cuisine from the resort’s own award-winning restaurants: Il Mulino New York Trattoria, Shula’s Steak House, Todd English’s bluezoo, and more, with wine and spirits samplings from around the globe. This year’s menus feature returning fan favorites alongside creative new dishes and offer attendees more than 90 food and beverage stations, 10 seminars, and five themed areas to enjoy. The Walt Disney World Swan and Dolphin Food & Wine Classic will celebrate its eighth year October 27-28, 2017 with new dishes and themed areas. This event will be the largest event to date featuring more than 60 food and beverage stations and 11 educational seminars taught by members of the resort’s award-winning food and beverage team. The Walt Disney World Swan and Dolphin Food & Wine Classic returns for its seventh year the weekend of Friday, October 28, and Saturday, October 29. 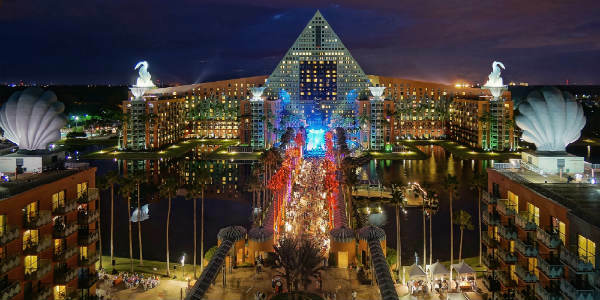 The Swan and Dolphin Food & Wine Classic offers guests unlimited tastings at more than 40 stations featuring culinary selections from the hotel’s award-winning restaurants and wine from more than 30 wineries, centered around the hotel’s scenic causeway. The Walt Disney World Swan and Dolphin Food & Wine Classic will return for its seventh year Friday, October 28, and Saturday, October 29, with exciting new dishes debuting alongside returning festival favorites. 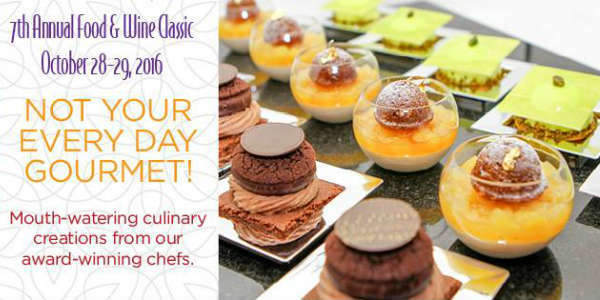 The Swan and Dolphin Food & Wine Classic offers guests unlimited tastings at more than 40 stations featuring culinary selections from the hotel’s award-winning restaurants and wine from more than 30 wineries amidst a festive backdrop of live entertainment on the hotel’s scenic causeway. 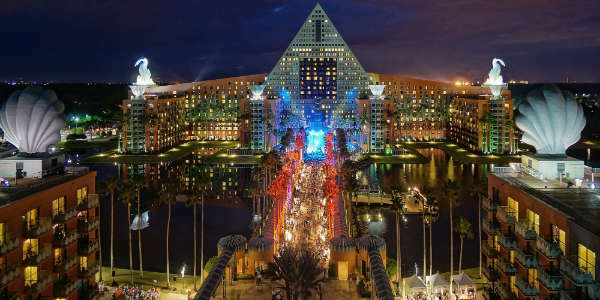 Back for its fourth year, the Walt Disney World Swan and Dolphin Food & Wine Classic presents the perfect opportunity to savor the flavor of culinary innovation at this two-night outdoor evening festival that takes place October 18 and 19. Set along the Walt Disney World Swan and Dolphin Hotel’s lush causeway, guests will be able to enjoy the delights of numerous food and wine stations; immerse themselves in food and wine education seminars; meet the masters behind the culinary magic – including celebrity chef Todd English, and take in some live entertainment at the same time. New to the educational lineup is a pasta-making seminar, hosted by hotel executive chef Robert Ciborowski, where guests will learn to make pasta dough from scratch and assist with the creation of specialty pastas. The wine education track will feature a new Italian wine class, where guests will learn the history of Italian wine and its influence on culture and cuisine. Returning beverage seminars include modern mixology, sake, beer, wine-blending, champagne, Riesling and Spanish wines. The seminars are led by the hotel’s certified culinary and beverage experts. I’ve seen snow Santas and sand Santas but the Walt Disney World Swan and Dolphin hotel has a Santa sculpture I’ve never seen before – a life-size chocolate Santa. 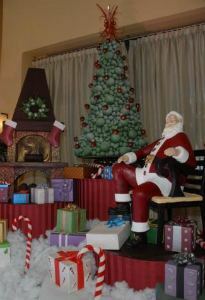 The entire display, complete with armchair, fireplace and Christmas tree, is made from 1,200 pounds of chocolate. According to the hotel, their world-champion executive pastry chef, Laurent Branlard, used 880 pounds of dark chocolate, 132 pounds of milk chocolate, 154 pounds of white chocolate and 120 pounds of cocoa butter. They also say this amazing creation contains almost 3,000,000 calories. Something tells me Weight Watchers would not approve. Not sure what they’re going to do with the sculpture when the holidays are over, but I sure hope they have the air conditioning cranked up to prevent it from melting in the meantime.